I always like to have my guest bedroom made up for visitors, whether expected or spontaneous. Complementary pastel colours create a warm and welcoming feeling, whilst vintage books and a beautiful dolls’ house remind me of an old-fashioned nursery, providing a comforting and relaxing escape from the busyness of modern life. Both the bed and this gorgeous, floral, vintage duvet cover were brilliant eBay bargains. I’ve layered the duvet up with thick, woollen blankets and a couple of pretty cushions for a wonderful night’s sleep. This pretty pastel duvet cover is complemented by thick woolly blankets for cooler nights. Pretty pinks, yellows and blues mix together in this beautiful pattern. Two cosy cushions provide both style and comfort. One in a beautiful blue Cath Kidston Boats print and the other, a lace-trimmed design which I found in a Charity shop. At the head of the bed hangs a small blue hand-made felt heart with the word ‘Love’ embroidered on it. This took hardly any time at all to make, but is a beautiful addition to the room and ties in nicely with the colour scheme. Little handmade touches make guests’ visits more personal. Next to the bed a small IKEA table (which I picked up in a Charity shop), provides a few overnight essentials, all presented in pretty glass jars or pots. The pink lamp (another Charity shop find) and the lace table cloth (courtesy of Mum) bring the colours in the room together. The drinks’ coaster is actually a sample from a website selling pretty bathroom tiling, but I thought the colour worked well with the rest of the room. On the second shelf of the table is a basket with a range of reading material: novels, interior decorating magazines, an anthology of short stories and a few childrens’ books. The bedside table provides a few essentials, prettily presented. A guest room should be a place where visitors feel welcomed and relaxed – a place to take time out from ‘ordinary’ life and spend time resting and recuperating. One of the best ways to rest and recover from the stresses of life, in my opinion, is to find a comfy spot to lose oneself in a good book. I’ve collected a beautiful range of vintage novels and children’s books from different second hand shops and vintage fairs, which I’ve displayed on the window sill, next to a comfortable chair. The chair was a kind donation from a friend who was moving and the cushion cover was made from an old piece of fabric which complemented the colours of the chair cushion. A beautiful selection of vintage books from childhood stories to old classics. The perfect place to curl up with a good book. These pictures hang above the reading chair. One is a Cath Kidston postcard in a simple wooden frame and the other is an old postcard I found on holiday in Devon a few years ago. These classic prints add to the vintage feel of the room. This beautiful dolls’ house was another kind donation from another kind friend who was also moving house. Whilst I have been spending time and money furnishing my house, I haven’t got round to putting much into the dolls’ house yet. I bought the old-fashioned suitcase on eBay and have used it as a stand for a vintage mirror that I picked up in a second-hand shop. Fresh flowers create a homely and inviting touch to welcome guests, regardless of the season. This vintage dolls’ house and old-fashioned suitcase create a lovely, nostalgic feel in the guest room. 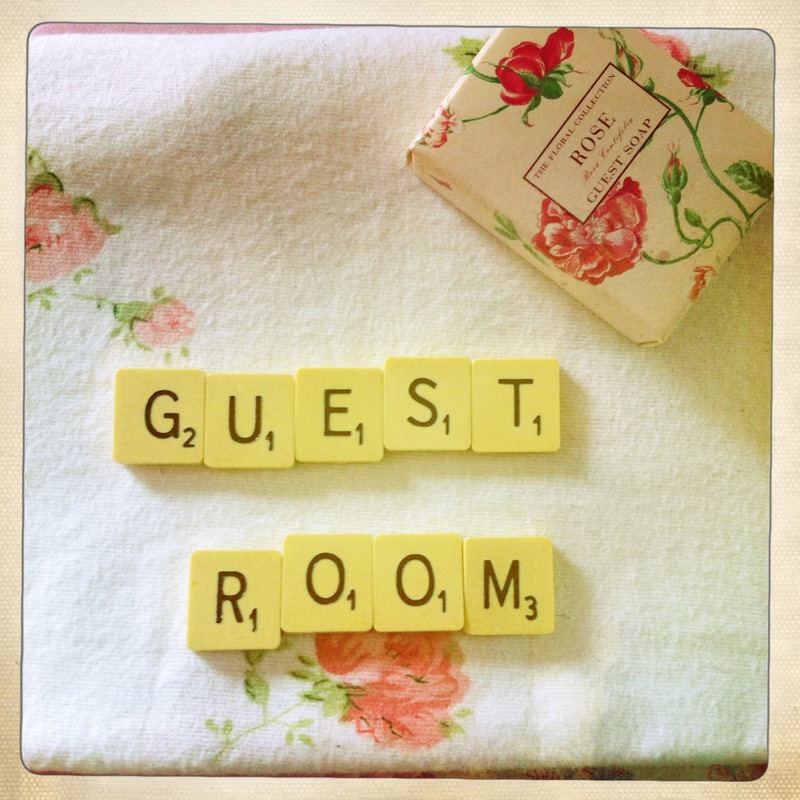 I hope that I have created a peaceful and inviting space in my guest room, where anyone would feel a welcomed guest. I hope that my visitors feel that my home is their home – a home away from home.